Lava flows are one of the common landforms encountered on various objects throughout the inner solar system, as well as on Jupiter’s volcanically active moon Io. Cameras and other remote sensing instruments on various spacecraft have returned an incredible amount of data about lava flows on planetary surfaces. Here we will highlight a couple of examples, along with recent work on lava flows on Earth that is providing new insight into how we can study lava flows on other planets. 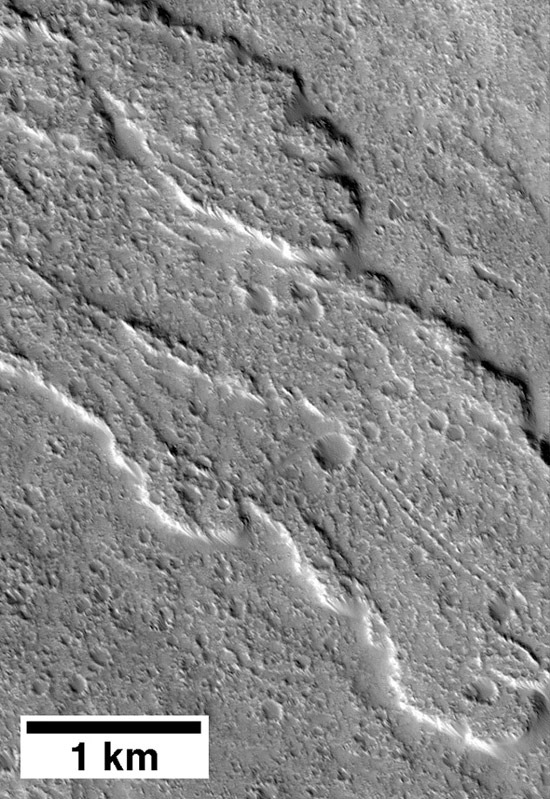 Image 1: The image is a portion of frame S08-02516 taken by the Mars Orbiter Camera, which shows part of a heavily cratered lava flow on the flank of the Ascraeus Mons shield volcano in the Tharsis region. The abundance of impact craters on the flow indicates that it is not very recent. Mars displays a wide array of volcanic landforms on its surface, particularly in and around the large Tharsis and Elysium volcanic centers. Unfortunately, both of these volcanic centers are buried beneath one to several meters of dust that has severely hampered compositional remote sensing of the lava flows, as well as obscuring morphology in the highest spatial resolution images. Io is the most volcanically active object in the solar system. Thermal imaging by Earth-based telescopes have monitored the volcanic activity on Io since active volcanoes were discovered by Voyager 1 in 1979. The Galileo mission also monitored the volcanic activity on this remarkable moon of Jupiter. 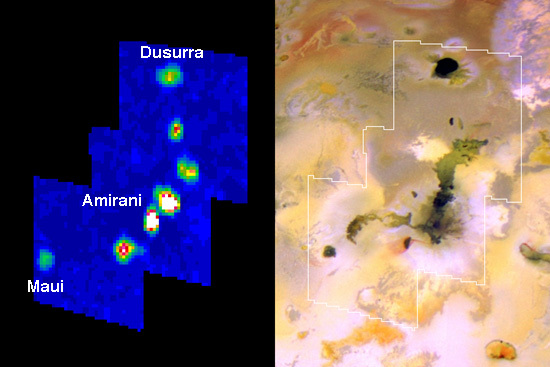 Image 2 shows four distinct hot spots associated with the Amirani volcanic center on Io. Some nearby volcanoes also display hot (active) regions. Image 2: NASA image PIA03533. Right panel: A Galileo visible-light view of several lava flows around the Amirani volcanic center on Io. Left panel: A thermal infrared (5 micron) view of the same region (note the outline of the infrared images on the right panel image), taken by the Galileo Near Infrared Mapping Spectrometer on August 6, 2001. Studies of lava flows on Earth continue to provide new ways of studying and interpreting data of lava flows on other planets. The 1907 eruption of Mauna Loa volcano on the Big Island of Hawaii emplaced a basaltic lava flow that covered 25.1 km2 during the 15 days that the eruption was active. Today the flow is the site of one of the largest subdivisions in Hawaii; the quarter-mile (400 m) road grid system provides excellent access to the lava flow (Image 3, a). Differential Global Positioning System surveys (Image 3, c) provide a precise view of the topography across the flow which shows the gentle slopes leading away from the central channel of the flow. The central channel at this location is quite deep because the last lava to this part of the flow was diverted by a breakout several hundred meters upslope of where the profile was measured. Field documentation of the topography and the flow surface texture of the 1907 flow will provide a valuable new data set to which planetary lava flows can be compared in the future. Image3: a) Ikonos image of the Mauna Loa volcano. 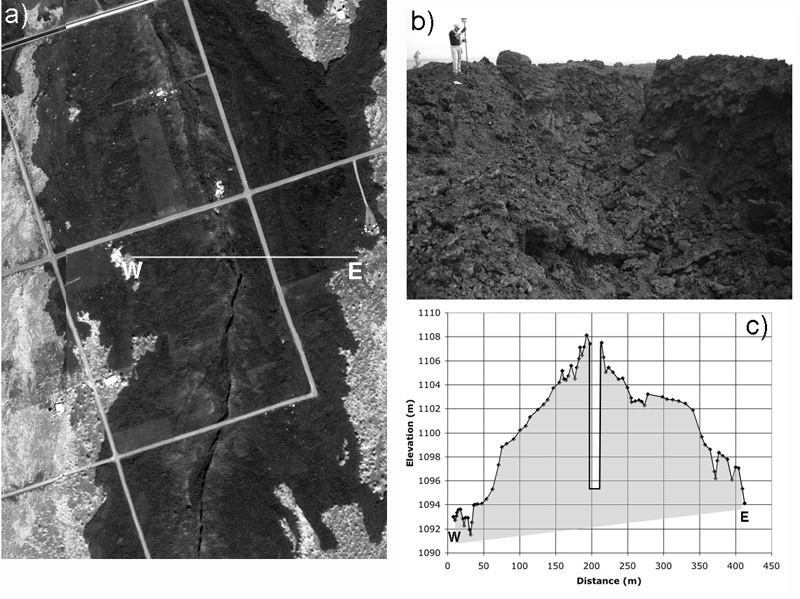 Image was taken by the Ikonos spacecraft in support of the Hawaii Synergy project of 2002. b) Collecting high resolution topographic data on the lava flow using differential GPS instrument (see line in Ikonos view for profile location). c) Plot of topographic data across lava flow.